It usually comes as a big surprise to those who haven’t checked it out before; the calorie count for alcohol is a substantial one. So before you get all smug thinking you’ve got your total weekly food calories calculated exactly, don’t forget to add on that extra glass of wine - or three. People who strictly monitor what they are eating, and find they can’t lose those extra pounds, may need to check out their drinks tally. Only fat has more calories per gram than alcohol, and the alcohol calories add absolutely nothing in the way of nutrition. There is evidence to suggest that, as well as being relaxing and fun, some alcohol, taken in moderation, can have medicinal benefits. In the long term, however, drinking more than a glass or two a day can seriously damage your health. You must weigh the benefits against the danger of developing a harmful habit. If you are watching your weight, you have to count the calorie cost of 7 calories per gram of alcohol. That is about 85 calories for a modest, standard pub glass of red wine. If you drink your wine out of the goblets used in many homes and restaurants, you could be consuming twice the calories. Low alcohol wines are much lower in calories. Low alcohol drinks can make a good alternative as long as they are not taken in larger amounts. They still contain varied amounts of alcohol and it is important to check the labels for strength. It is also important to remember that low alcohol drinks contain more chemical additives than full strength drinks. With beers, the calorie difference between low alcohol and standard beers is not so marked. Low alcohol beers range from 40 to 80 calories for a half pint, compared to around 85 for a small can of ordinary beer or lager to as many as 175 calories for a pint. Strong beers are very high in calories, having 170 for a small can and 350 for a full pint. Hard spirits like gin and vodka have around 50 calories or more in a single shot, depending on the proof strength, plus the calories contained in whatever is your mixer drink of choice. If you are drinking spirits keep the calorie count down by using slim line mixers. Liqueur, like coffee liqueur, is even higher in calories at 160 for a 1.5 ounce shot. Fruity tropical drinks like pina coladas will put your calorie count through the roof. Alcohol is a diuretic, that is it makes the body lose water, so it dehydrates you. 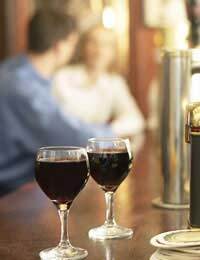 For the sake of your health it is best if you do drink to try to limit your drinking to three or four drinks a week, preferably red wine. When drinking alcohol it helps to drink some water with it, to prevent dehydration. The recommended levels of alcohol consumption are measured in units, with the current acceptable limits for men set at 21 units per week and for women 14 units per week. Bear in mind that these measures for wine are for standard glasses and not goblets.